Planing travel to Ukraine? Read about visa to our country. If you're planning to travel to Ukraine with any purpose, you certainly need a visa to come here. This process can't be called a hard one - it only contains two steps that you will easily perform with the help of official offices. For the first step, you need to get an invitation or a letter that will confirm that you have a good purpose of visiting the country. If the company that sent you a letter is authorized by official Ministry of Foreign and Internal Affairs, you will get the confirmation and can continue making your visa. There is, however, a limited list of countries that do not need an invitation or letter to get the Ukrainian Visa. Visas, offered without a letter or invitation, can be official, cultural, sports and private. The best way to get visa is to set “Visit Kiev” as primary purpose. But if you have an official purpose to work here, it will be far much more easier for you to get this visa. • And last but not least, if your country is not on the list mentioned above, you should have one of the following documents: invitation, registered in local OVIR from your friend or relative (for private purpose of visit), invitation or official letter of one of the Organizations registered in Ukraine (for official purpose of visit), touristic confirmation or hotel confirmation with stamps required (for touristic purpose of visit). 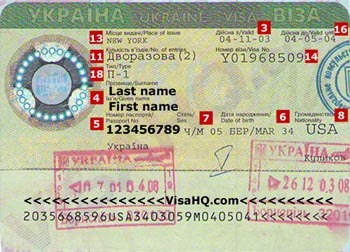 There are, in general, four kinds of visa to get to Ukraine - one of them is business (in case you're travelling to have business meetings or to work in Ukraine on legal terms), one is private (to have meetings with your friends and relatives), one is touristic (for exploring beauty of Ukraine and Kiev particularly) and one is transit. Transit visa is most easy to get, but this one is given to stay in airport or transit zone during the time between flights. You can get your visa application form on internet and print it, then write down all the required information and get it to Ukrainian Embassy in your city or first big city next to yours. That's important: you should print down the information or write it in block letters, otherwise your application will not be valid. The duration of your visa can vary because of the type of it. US citizens have the privilege over other ones - the visa they are getting is valid during longer time than for the others. For example, multiple entry visa is valid up to 3 years for US citizens, and for other visitors it is valid up to 1 year. Certain duration of your visa will be told to you by Embassy worker that will work with your documents and give you a visa. Application fee may differ from 100 to 250 USD in different countries. To get a visa, you should get a number of receipt in Consular Office, and add an envelop with your address, if you need to get your documents mailed to you.